The next day I was walking back from a nearby market in a cheerful mood, when I saw the usual company, but the atmosphere was completely different. Instead of lively amusement usually accompanying the thrill of the game, I saw everybody with cards put aside, their heads shaking from time to time. They were all ears, listening to a woman from the neighborhood, who was telling something and sobbed violently. Her red tearful eyes searching for support said it all. I offered the girl some water and asked what had happened and how I could help. Weeping and trembling in emotions, she answered in a rather good English, as far as I could judge, that she needed badly to get to her family house situated 236 miles away from here as soon as possible. The locals couldn’t help - they mentioned lack of time or ‘important’ gambling affairs. I decided not to go deep into the story, but asked her to stay there a few minutes. I took the stuff I’d bought out of my backpack and filled it with the essentials we would need for a trip. A few minutes later our tuk-tuk rattled down the cobblestone road to the nearest bus station, bouncing and swinging, bumping every pebble and pothole. It turned out the bus tickets had been sold out, so we had to make the first 155 miles to the Cambodian capital in a small old Toyota together with several more passengers. Mile by mile my neighbor kept us immersed in her sad story. An hour before our first meeting she found out that one of the three brothers of hers had had a motorbike accident. A paramedic, who had arrived in an ambulance to the accident scene, was the first to let her know about the tragedy. The three young boys were taken to the closest district hospital. There were several phone calls from the doctor while we were on our way. Each call made the gleam of hope in her eyes get dimmer and dimmer. She fainted twice in my arms: the first time - when she heard one of the injured had deceased without regaining consciousness, and the second time - when she was told her 19-year-old brother had passed away. None survived. At last we covered the most part of the distance. In the capital we dropped by one of the numerous bike rentals and, following my companion’s advice, I took a Honda sportbike with studded tires. It reminded a racing greyhound - slim, high and slightly arched. When I straddled the bike, my feet could barely touch the ground. Sixty odd miles at 95 degrees Fahrenheit was a tough challenge, I must say! Furthermore we had to maintain a high speed to arrive before dark. When the asphalt road ended, we made a stop before the last and the most challenging part of our trip. My hands trembled as if electricity had passed through them. My T-shirt and shorts were drenched in sweat. The ride was immortalized in an exhaust pipe burn on my leg. The girl coped with the situation quite well in spite of what she had been through. For the first time since the beginning of our trip I looked around to see a real Cambodian village. Dozens of kids playing outdoors, peasants tired after the work day, and jolly drunks - as soon as they noticed us, they all greeted us cheerfully and waved. We had to move slowly and carefully, trying to avoid huge puddles and boggy places, where indifferent tall herons were standing still, domestic ducks were scampering around with their ducklings, dogs were barking, and white cows were walking solemnly with their calves. Smoldering fires were seen on both sides of the road. The smoke formed white vaguely-outlined arches. When, amidst an endless field of tobacco, a young stallion galloped out of one of the arches all of a sudden, its bell on the neck ringing, crossed the road in three long jumps and disappeared in heavy smoke in a blink of an eye, I thought it was hallucination, as the picture was quite surrealistic. The rustic courtyard was lit by the only fluorescent lamp. Its cold light covered only the central part of the courtyard, not reaching the remote corners. They had electricity for several hours a day starting from 6 p.m. - it was rather expensive, so one bulb per house was a matter of course. People from the neighborhood gradually filled the courtyard and encircled us. When I realized I was still wearing the helmet, I got rid of its stuffy and tight embrace, and appeared at my best before the spectators. All over in mud, my bristle almost as long as my hair, and soaked in sweat, I was standing there, in the middle of nowhere, lit by an electric moon, looked at by dozens of attentive eyes. When it turned out that I was the first foreigner ever visiting this village, I felt ashamed for my appearance. I looked around smiling guiltily, which caused excitement, and everybody present - from kids to old people - smiled back. The people gave way to us, I made several steps and sank to the stairs leading into the house. My companion brought a pot and a bar of soap, and pointed at a row of big jars with water seen here and there in the courtyard. ‘‘Grab any and wash yourself,’’ she said. I turned round the corner of the house, where nobody could see me, and poured half a big jar of warm rainwater over myself. While I was tampering with the pot, cleaning one spot and soiling another at the same time, they made a dinner and bed for me. So many things had happened during that hard day! I went up the stairs into the house, expressed my gratitude for the dinner and fell asleep immediately, enveloped in the delicate smell of tobacco leaves cured downstairs. The population of this and many other neighboring villages made their living by growing and curing tobacco, and preparing it for further export to Vietnam. Soon I got well, and we started back after several days. I left the house with a heavy heart. I got used to the people who gave me shelter, and got a taste of the joy and grief of real life. 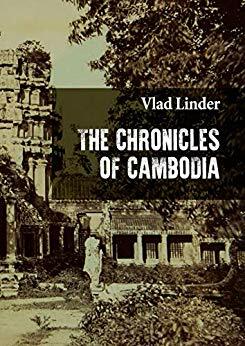 © My name is Vlad Linder, I am the author of the book "The Chronicles of Cambodia".